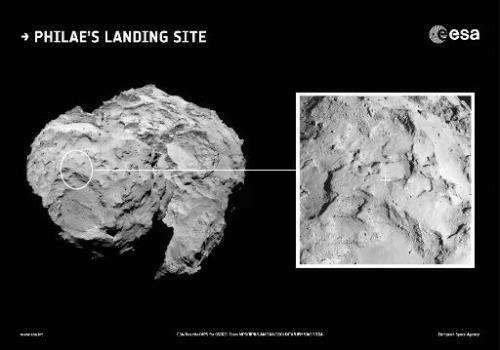 The European Space Agency (ESA) ordered a probe to attempt Wednesday the first landing on a comet and investigate one of the great mysteries of the Solar System. "We've got the final go" for the operation, an ESA spokeswoman said at mission control in Darmstadt, Germany. Philae, a robot lab bearing 10 instruments, will be ordered to separate from its mother ship Rosetta at 0835 GMT, the agency said, after the last of four checks. Half a billion kilometres (300 million miles) from Earth, it will descend towards Comet 67P/Churyumov-Gerasimenko, racing towards the Sun. "Final Go/NOGO complete! We're GO for separation!! !," the Rosetta mission said in a tweet. If all goes well, Philae will touch down about seven hours later before carrying out scientific experiments on its surface—a double first in space history. Conceived in the 1980s, the Rosetta mission seeks to reveal secrets about the origins of the Solar System and maybe even life on Earth. The 1.3-billion-euro ($1.6-billion) project was approved in 1993. Rosetta, carrying Philae, was hoisted into space in 2004, but needed more than a decade to reach its target in August this year—a six-billion-kilometre (3.75-billion-mile) trek around the inner Solar System. 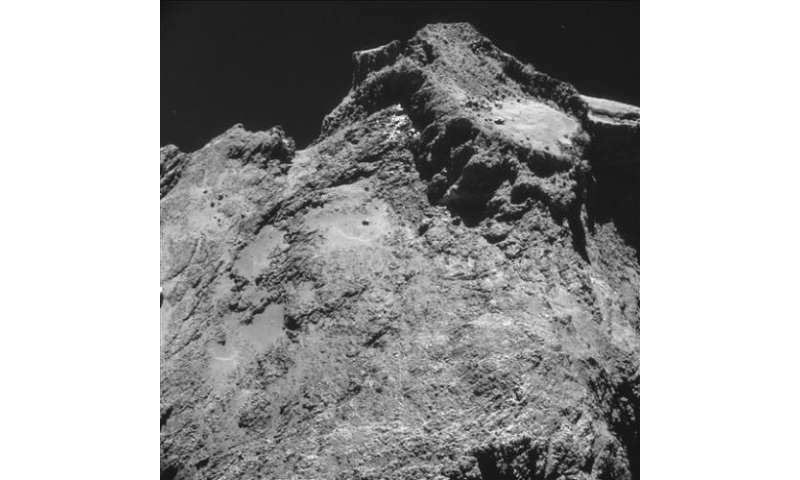 Turning slowly around "67P" since its rendezvous, Rosetta has made some astonishing observations. The comet's profile somewhat resembles that of a rubber bath duck—but a 'toy' darker than the blackest coal, and gnarled and battered from billions of years in space. It has a treacherous, irregular surface, with crags, cliffs and rocks—an extremely difficult target to land on. The big test will be for Philae to settle down safely as Rosetta and 67P zip towards the Sun at a breakneck 18 kilometres per second (11 miles per second). "Everyone's nervous, everyone's on tenterhooks, but we know the risk is worth taking. The rewards are enormous," ESA senior science advisor Mark McCaughrean said. "You won't get anything without taking risks. Exploration is all about going to the limits." "We know that it's a risky business, but the potential gain is so great," said Jean-Pierre Bibring, in charge of Philae's scientific operations. Philae has no thrusters, which means Rosetta can only eject it when the velocity and trajectory are exactly right. Any error in its course will widen during descent—the fridge-sized probe could miss its landing site and smash into the many hazards nearby. "Landing is the most critical moment of all," said Stephan Ulamec, in charge of Philae at the German aerospace firm DLR. Philae is meant to settle down at a gentle 3.5 km per hour, firing two harpoons into a surface that engineers fervently hope will provide enough grip. Ice screws at the end of its three gangly legs will then be driven into the low-gravity comet to stop the probe bouncing back into space. A confirmation signal about touchdown is expected on Earth at about 1600 GMT. Philae accounts for about a fifth of the haul of scientific data expected from the mission in its entirety. Comets are believed to be primordial ice and carbon dust left over from the building of the Solar System. They are doomed to circle the Sun in orbits that can range from a few years to millennia. According to a leading theory, comets pounded the fledgling Earth 4.6 billion years ago, providing it with carbon molecules and precious water—part of the tool kit for life. The New York Times as a great series of photos of the comet, better than any phys.org has published. Is physorg in to selling iGadets? Blame livestream if their mobile pages screw up. This link says all you need is the wretched adobe flash plugin. Works fine for me on a Windows machine and Firefox. Maybe update your flash player? Works fine for me on Windows and Chrome. Physorg should assume responsibility for it's web pages and before I rant, I check things out. On Android neither Opera, Chrome or Firefox worked. (A link for iPhones is served as is visible on the link...) => Livestream wants to promote their Livestream app.... Another app ... another set of access rights to grant etc. Not a web experience to enjoy. I'm for standards. And yes, if I truly want to see something when I'm obstructed by what I call bad website programming (sorry) then I fall back on my old PC. This works most of the time.